Bobby Johnson unexpectedly resigned yesterday as head coach of the Vanderbilt Commodores. That's a huge loss for Vandy, as well as a big loss for the Southeastern Conference. Johnson is a man of character and class, and he exemplified both as the head man of the 'Dores. His winning percentage wasn't very good during his reign in Nashville (29-66), but he did make Vanderbilt a very competitive team. That is not the easiest of tasks at a school which still values higher education strongly over intercollegiate athletics, not to mention playing in the toughest football conference in America. One of Johnson's biggest obstacles was recruiting numbers, meaning building depth. His starting eleven on both sides of the ball had improved tremendously since he arrived at Vanderbilt. He just did not have as deep a bench as his conference competition. 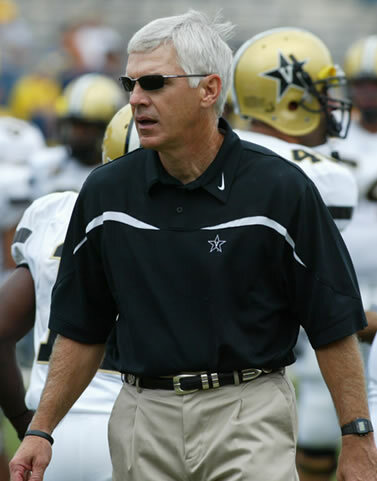 He led the Commodores to their first bowl victory in 53 years when they defeated Boston College in the 2008 Music City Bowl. Johnson was also named S.E.C. Coach of the Year that season. He leaves in a fourth place tie for the most wins in the program's history.